Global suppliers of innovative floating modular dock solutions, Marine IP announces it has shipped three more VersaDock floating docks to the America’s Cup Endeavour Programme in Bermuda. 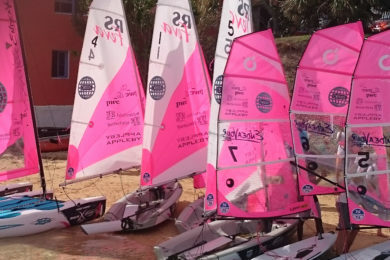 As a supporter to the Programme, an educational initiative to teach local youngsters across Bermuda to learn more about sailing, VersaDock has already provided the first batch of platforms which will be used to accommodate the dinghies out of the water and also act as a pontoon for coming alongside. With the America’s Cup underway in the waters off the island, Bermuda has high hopes for a sporting legacy that will live on after the America’s Cup racing finishes. During the Cup season the focus of the training for the young sailors will be more intense than ever, hence the need for more dock space. VersaDock’s modular Drive on Docks already house the coach boats and safety RIBs so that they can dry dock. The modular drive-on docking systems make it easy for the boats in the Programme’s fleet to be accessible to the children as soon as the dinghies are on the water, delivering sail training and offering safety for the group. All the boats are effortlessly stored on the stable docks out of the water after each training session. Each student on the Programme is able to take part in a five-day programme of sailing and water safety and gets to tour the America’s Cup facilities as well. VersaDock joins other top international marine industry names in supporting the Programme and their training fleet. “We are proud to be supplying the Endeavour Program that is associated with the America’s Cup, while at the same time it is great to see our equipment being used by such a worthy cause in giving children from all backgrounds in Bermuda the opportunity to sail and get excited about the Cup being hosted in their home territory,” says Hooper.